First of all, thanks for attending my session! It was my first time presenting in such an arena, so I genuinely appreciate your participation and feedback. Now, let’s get right to it. 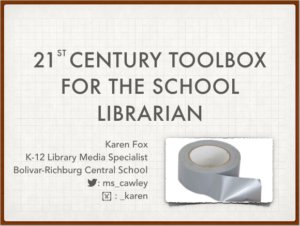 Click the image below for a PDF of my presentation. I’ve removed some slides that don’t make much sense out of context, as well as the entire social media section because, if you recall, my expert advise is to do what you’re comfortable with, which isn’t exactly earth-shattering. Please note! The MARC fields/subfields referenced are what I use to hack my automation system. Before making changes to the records in your catalog, contact your automation system guy (or lady) to clarify that it will work the same way. Whether it’s a BOCES contact or someone from the company, we’ve all got a guy (or lady). Call yours! Here’s my bookmark, which I print two-sided on card stock. 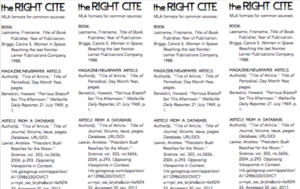 When I’m teaching a lesson that includes citations, I mention the bookmarks and show students where they can be found in the library (hint: they’re on my cart of student resources, with other bookmarks and reference sheets, along with the stapler, extra writing utensils, etc.). I always use a bookmark as my reference when working on citations with students one-on-one. We work from the bookmark and the student just keeps it when we’re done. 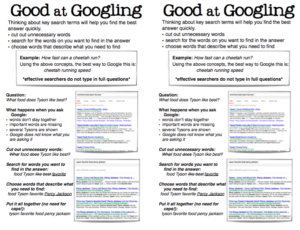 I also referenced my Good at Googling handout in my presentation. This is a one-sided half sheet, so the attachment will print two handouts per letter-sized sheet of paper. 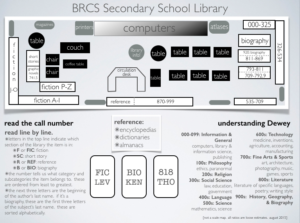 While I have this out for students all of the time, I don’t think this works well as a standalone handout. I designed it to go along with a lesson, so the concepts have some more meaning than just what you see on the page. Regardless, I like that this format cuts to the chase of creating keyword searches in popular search engines. 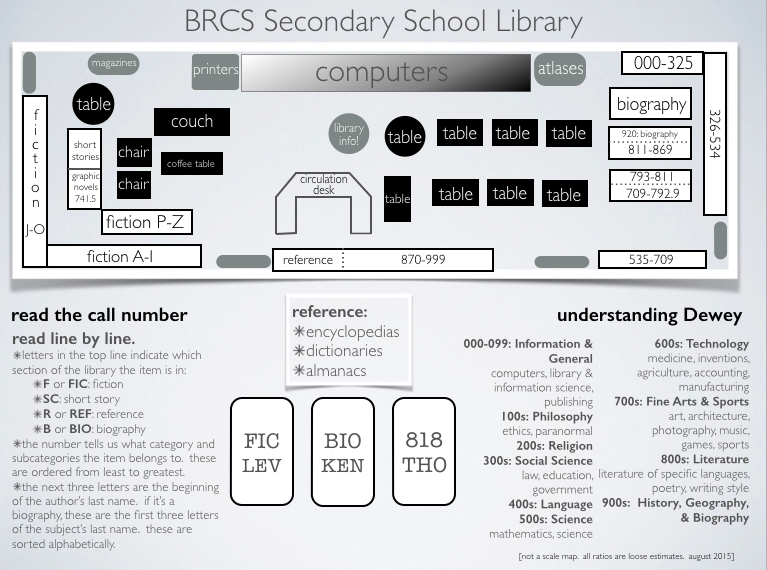 The linked photo below will take you to the Keynote file of my library map for you to manipulate for your own use. However, be advised that you’ll need a program that will open a Keynote file, which is Apple’s version of PowerPoint. If you don’t have Keynote, you can click right here for a bigger version of the thumbnail to see the details.